This photo of Savannah is a proud example of my picture taking prowess. Even a fraction of her looks cute, though! Her hair looks like a brownish-red to me, what do you think? Thank goodness for digital cameras where you don't need to PAY for a picture that you mess up! Speaking of messing up, I forgot to mention in yesterdays blog that the non-skid rubberized Peds I invented recently on the blog already exist! Heather, Savannah and I saw them at Wal-mart in Rhode Island. Another money maker down the drain. I want royalties! I just tried to find a link to a website selling them, but I couldn't find them easily. I'm off shortly to water aerobics, then the grocery store, then Charlie and I are going to see the new Indiana Jones movie. Savannah is so happy that it's Friday! We are expecting temps near 90 for the forseeable future. I went in the outdoor pool at the health club yesterday but the water was still a bit cold. I told myself not to be a sissy and GET IN. I found 2 socks this week in unexpected places. I found one of them in my swim bag yesterday, and another one I found this morning in another lingerie drawer (not the sock drawer). So what, you say? Well - I found these two socks, in two different places, in two different days - AND THEY MATCH! I thought that was funny. They have been missing for weeks, but I found them both and they are both 'of a kind'. 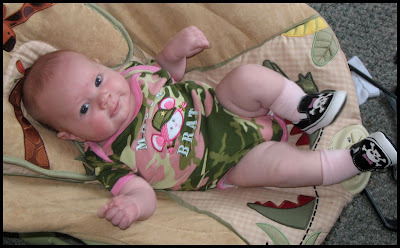 Speaking of socks - anyone who has been around Savannah has seen her adorable Mary Jane socks - they look like shoes but the shoes are printed on them and they come in lots of colors to match her outfits. They are my #1 favorite recommendation if anyone wants to give a baby gift to someone. AND GUESS WHAT?? They have ballerina slipper ones and sneaker ones, and Mickey Mouse ones - adorable! I am itching to order some - Heather - what do you think? Gotta go! Have a nice Friday and a nice weekend! Day 830 - Happy Belated Birthday, Mom! Yesterday was my mother's birthday and I didn't even get a chance to blog about it. Two things from yesterday - a celebration of a birthday for Mom, and our sympathy goes out to Gilbert on the loss of his father. What a difference a day makes (sounds like a song) - yesterday's work issues are gone and I got some good rest last night with the exception of some wierd dreams. 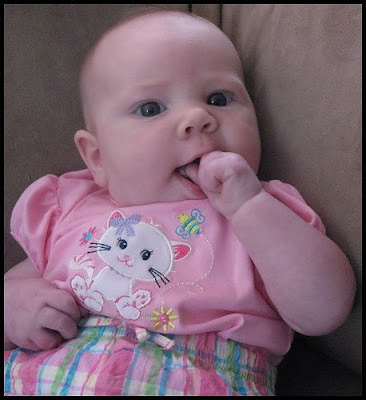 Here is a cute new photo of Savannah chewing on her hand - YUM-O says Rachael Ray! I'm running a little bit late this morning so I'll just tell one story from the pool. A little boy - three or four years old, was carrying a noodle (longer than he was) around the indoor pool area, just playing with it on the floor outside of the pool. His mother wasn't paying much attention to him until she noticed that he had carried it over to the water's edge and was trying to WHACK THE LAP SWIMMERS WITH THE NOODLE AS THEY CAME TO THE END OF THE POOL TO FLIP OVER! She ran over - horrified - and literally dragged him away from the swimmers. HAHAHA! Take care and have a nice Thursday! TTFN! Day 828 - Cute! Cute! Cute! Look at this adorable funny face! 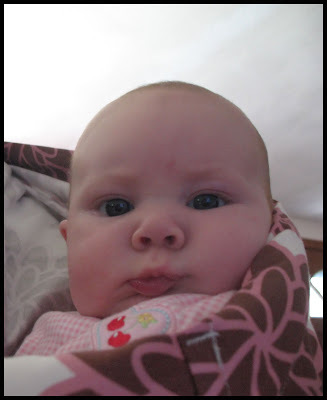 I am so thrilled when I can capture one of her cute faces on camera. 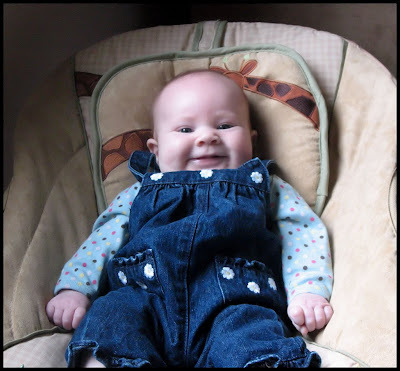 She's changed so much in the last few weeks - she knows how to smile and coo, and she chews on her fist and stares hungrily at her toes! My flight back to Tennessee went fine yesterday. Charlie met me at the health club and we attempted a workout surrounded by little kids. Aside from one grandfather, we were the oldest ones in the pool. The kids would have been outside, but we had thunderstorms and everyone had to come in from the outdoor pool. We had an outstanding dinner at TY and SY's - catfish and bream that 'the guys' caught last week, white beans, two salads, wheat rolls, and fruit salad for dessert drizzled with sweet strawberry wine. A gourmet meal! Gotta go - TTFN and have a nice day back at work! Greetings, Bloggy Memorial Day Celebrants! A short pause to commemorate the sacrifices our servicemen and women give to our country to keep us safe! Special thoughts go to my nephew at Ft. Bragg who has safely returned several times from Iraq. 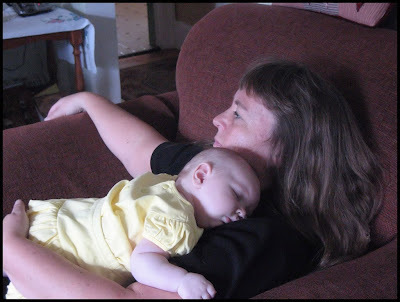 Here is a photo of 'my Grandmotherly occupation' this weekend - to be a living port-a-bed for Savannah to lay on. It is a job I love to have! She burrows and nuzzles into my shoulder like a little puppy - it is the most adorable thing! We had another superb day yesterday. I got to see Heather's new place, go shopping with Heather and the baby, have more delicious Dunkin Donuts Iced Coffee, and have another cookout with the family. What could be better? Side note - my son mentioned how gray my hair is getting...oops! It is true, but just in my bangs. I need to leave in an hour for the airport - 'brudda in law' is taking me. I've already checked the airfares for 4th of July but they're too high. Drat. I'll keep an eye out for the next fare war, and I also need to book my trip for Thanksgiving week when Southwest starts selling that time period. When I get back to Tennessee, I'm stopping at the health club to swim. I bet the outdoor pool will be very busy this afternoon. Tonight Charlie and I are having dinner at TY and SY's - so I don't need to worry about cooking! TTFN and THANKS SO MUCH to Lyn, Steve, Heather and Evan for such a nice visit! Day 826 - One More Day? OH NO! I have to check in for my flight at 10:30am today - unfortunately I only have one more day of Squeezing Savannah. I won't think of that right now. Here is a photo from our wonderful day yesterday - isn't this an adorable outfit? We had an excellent time. Savannah has changed so much in the last 6 weeks! We took her with us on a walk to Dunkin Donuts, and she attracted attention from the neighbors, the Dunkin Donuts staff and even the customers! My son brought littleneck clams and garlic and oil for our lunch - YUM-O! We gobbled up 50 of them in no time at all. We visited, had lots of company, and a delicious cookout of hotdogs, hamburgers, steak, chicken, pork chops, sausage, corn on the cob, baked beans, macaroni salad, fruit salad, greean salad, and more! Gonna have another outstanding day today! TTFN! Day 825 - I'm here! Here I am, in Savannah Land again! I left work yesterday a little after 2pm, drove to Nashville, went to the Kmart very close to the airport and purchased a book to read on the plane. I was in line to pay for the book when another woman asked the cashier 'Where are the books?' which tells me a lot of folks have the same idea. The book section should be bigger there, but I managed to find a book to read. Then I dropped my car at the Park and Fly place next door to Kmart where they whisk you off to the airport and drop you right where you need to be. I love that place. The flight was completely full, being a holiday weekend AND graduation time of the year. We arrived in Providence about 20 mins late, but no big deal. Evan was waiting, and speaking of waiting - my suitcase was practically the LAST one to come out. Heather and Savannah will be coming over later this morning, Evan will be here around noontime, and we'll have a cookout late this afternoon with more company! 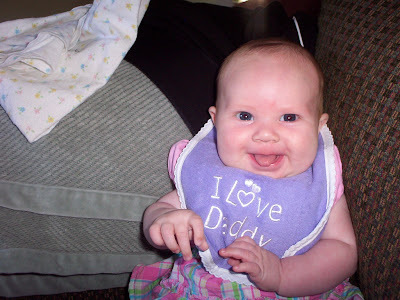 Look how happy Savannah is that her Grammy 'Gigi' is coming to visit! Gigi stands for 'GG' which is Grammy Goldsmith, by the way. This is going to be short because I still need to pick out a book to read on the plane. I will spend Memorial Weekend with 'the fam', and I'll hit the road this afternoon for the airport. Savannah is amused because I chose the wrong person when I predicted the young David would win. Oops. Hi, darling Savannah! See you soon! Okay, I was WRONG, but it's all RIGHT, because I liked both Davids. I just favored the young one more because he's only 17 and such an excellent singer! I am happy and proud of both of them. So there. And no, I didn't vote. I enjoyed some of the show. David Cook singing with Z Z Top was my favorite segment. I thought the Idol singers were better than some of the 'big names' they had on, and I thought the segment with the 'You are my friend' with the cheerleaders and band was AWFUL AWFUL AWFUL. So now it's OVER, and it's time to move on to the 'Think you can dance' show, which starts tonight (for two hours). I think the dancers on that show are both original and awesome. Have a great Thursday and TTFN! Yes, it's really me, writing the blog today instead of scheduling when it posts. 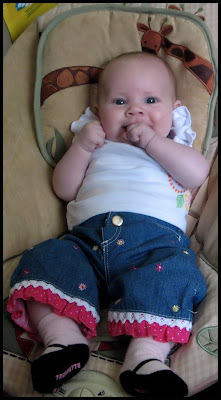 And yes, that is really the cutest girl ever - grinning at her mother and chewing on her fist. What a cutie pie! Just a couple of days and I'll be in New England to see everyone. I can't wait! It is hard to believe it is almost Memorial Weekend, the weather hasn't been very 'summery' yet. My class is finished and I didn't need to take an exam, so no pressure there. The instructor is moving to Nashville next month, she is excited about that. There were three folks from Los Angeles at the class, and they marveled at how little traffic there is in Nashville. That may be true - comparatively speaking, because I have seen Los Angeles traffic and it is unbelievably bad. Going to and from class - I saw at least one fender bender each day on the highway, and last weekend I 'heard' a wreck before I saw it. One driver was using the center turn lane as a travel lane, and the other driver was getting into the center turn lane. That is where they met. Yesterday I saw a panel truck using the breakdown lane as a travel lane, my favorite stunt. Changing subjects - the battle of the Davids for American Idol is almost done - I am happy with whichever one takes it, but would prefer 'young David' over 'old David'. On last night's show, both of them looked exhausted, emotional and almost ready to pass out! Hey - don't miss the 'So you think you can dance' show that starts Thursday night - I like it far better than 'Dancing with the stars'. Day 821 - This place is a Paradise! 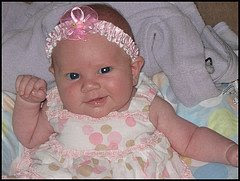 Here's the darling girl again, looking adorable as always! It's really Monday night, by the way. I am going to do the same thing I did yesterday - write the blog in advance and publish it automatically (or automagically you might say). The health club has opened the outdoor pool for the season - it really wasn't that nice out when I was there at 5pm. It was warm enough but overcast and windy. A couple of small kids were 'whooping it up' at the outdoor pool and their mothers were sitting on lounge chairs looking cold. One boy - I guess he was 5 or 6 years old- tore off his shirt and exclaimed 'This is COOL' before he ever went in. Then I heard him yell 'This place is a PARADISE!' and it really made my day to hear how excited he was about being there. It was nice to hear. I hope your Tuesday is exciting - I'll be at class again today! TTFN! Nothing Blah about this new and totally adorable photo of Savannah! Can't wait to see her (and the rest of the family of course) this coming weekend! I am trying something new - I am going to attempt to have this automatically publish at 6am Monday morning - right now it is 6:20pm on Sunday night. I'm not going to work on Monday or Tuesday - I have another training class to attend. (Back to the same training location where I have been to other classes recently). That means I won't get any exercise AND they will bring in free breakfast in the morning and goodies (brownies, pastry, cookies) every afternoon. THAT means I have to leave early and go work out before class. MAYBE that will get my metabolism in gear to fight off some of the calories. (and that's a big MAYBE). Anyway - if this works, my blog is written for the day and I'll be happy as a clam. If it doesn't work, I'll be grumpy but life will go on. Time for the blog has been coming up short this weekend. Charlie and I are leaving shortly for the health club. After our swim, we're going to go see 'IronMan' at the Opry Mills theatre (we are going there because they have matinee shows in the summer starting at 9:30am). After that - we'll probably need lunch. After that - we need to go shop for a new printer for our home PC - ours is dead as a doornail and I have to print my boarding pass Thursday for my trip to New England! See you soon, family! No time to blog, gotta go to water aerobics. Yesterday's high was 62 - the normal high is 77 this time of year. It was FORTY-TWO this morning - freezing! Day 817 - Friday is MY day! Hooray! Friday! This has been a very busy week, and it is hard to believe it's Friday. March in a circle (or kick your feet and make noise if you can't walk or talk yet) chanting 'Fri-day! Fri-day! Fri-day! 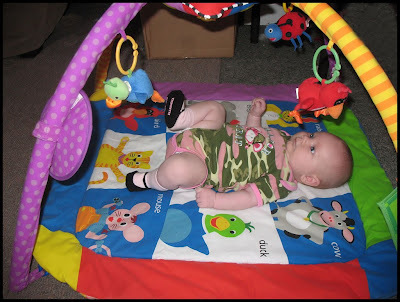 Here is little Miss Savannah on her play surface - cute! I forgot to mention that I saw a tractor-trailer cab (without the trailer on it) veer off the highway and DRIVE IN THE BREAKDOWN LANE recently. The traffic on the highway was at a standstill (maybe a crawl), and he just didn't feel like waiting. The driver was going fast too, and there were places where you could NOT SEE what was ahead due to a rise in the road. If there had been anyone or anything in the breakdown lane, that tractor trailer would have plowed right into them. I wish I could have gotten the license plate and reported the driver. The moral of the story is - be careful on the road and have a great Friday! 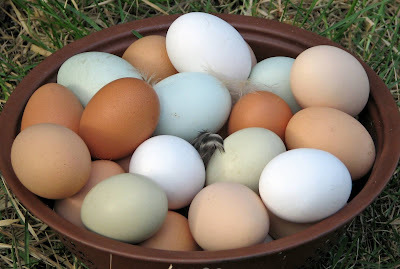 This photo came from the web, but it's a good illustration of the variety of colors farm fresh eggs will come in. Eggs are in plenty right now - must be the spring! Two of the next door neighbors kids came over the other day and knocked on the patio door. Their ever-present dog was wagging along with them - like they were on a big adventure, and surprisingly their siamese cat came along too. I am sure their horses would have come over too if they could! They handed me an 18-pack carton of eggs from their chickens, confessing that 'One is missing because we dropped it and broke it, and there might be a little dirt in the carton too with the other ones'. The little boy said 'Nah - we talked to him YESTERDAY'. HA! Changing subjects - My two favorite 'Davids' have made it to the Final Two of American Idol. I am still pulling for 'young David' to win it, but I am also just fine with David Cook winning. They will both do well in their careers whether they win first place or second. Have a nice day, everyone! Friday is TOMORROW! 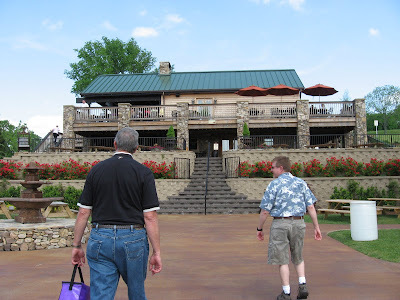 This is another photo from our Arrington winery visit last weekend. Would you look at this GORGEOUS wooden table and chairs on the 'main deck'? 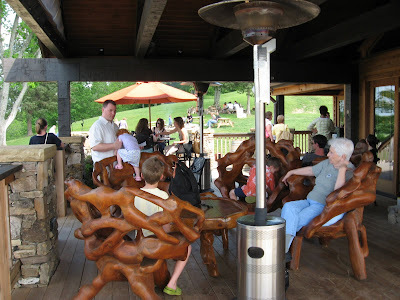 I absolutely love 'lodge style' wood furniture, especially that free form contemporary style. Anybody have a clue what that furniture might be made of? Check out the little kid climbing up the chair on the far side of the photo. Back to reality - my seminar/conference went fine yesterday, and during the lunch break several of us walked around the atrium rooms of the Opryland hotel. After the seminar was over, I met my friend over at the Opry Mills Mall for a chat, then I shopped a bit, then I went home. A very nice day. Duty calls! Gotta run! Have a nice Wednesday! I am going to park over at the Opry Mills Mall and walk over to the convention area rather than paying upwards of $20 to park. I am not looking forward to rush hour traffic, but theres nothing to be done about that. I'll need to leave early and just be prepared to sit in traffic for a while. This lovely place is the Arrington Vineyard. 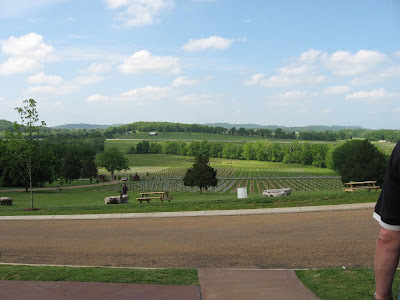 Arrington Vineyards is a 75 acre property (partly owned by Kix Brooks of Brooks & Dunn, the country music duo) and winery about 20 miles from our house! We had never been there before. Charlie, Buddy Joe (both pictured) and I visited there on Saturday, and had a lovely afternoon. They also have a big firepit on one side of the lawn, and the woodsmoke makes everything smell so nice! There are picnic tables everywhere. They have music there starting at 5pm on the weekends, we were leaving as the band was setting up. I'm running late, so I'd better go! Day 812 - Happy Mothers Day! No time to blog at the moment - having a problem with my Saturday night job at work. Maybe more later. Day 811 - Happy Belated Birthday! 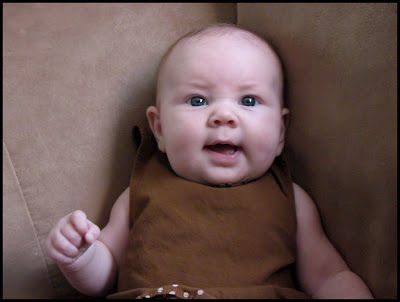 Belated birthday wishes go to Aunts Nancy and Mary Ann, and also my niece in California! I honestly don't know the Aunts and Uncles birthdays, my mother will need to remind me next year. No time for bloggage, buddy Joe will be here between 10 and 10:30, and we will arrive at Papa Boudreauxs in time for their special crawfish boil today that starts at noon. They had one a few weeks ago, and we didn't know so we missed it. 'Papa' said they went through 800 pounds of crawfish. That is a LOT of crawfish. I am doing the 'company coming' thing - clean sheets and towels, scrub the tub, wash the kitchen floor, etc. Day 810 - Friday, wonderful Friday! 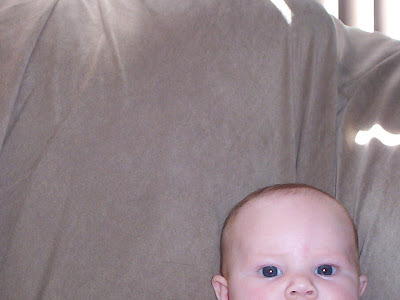 This is a slightly different picture than I had on the blog the other day. Major Cuteness, not Major Brat! It is already after 6am, and I have been running in slow motion for the last couple days. I have also been a klutz. Yesterday at the coffee station I pressed the brew button before I had put in the filter basket (I have never done this before in the time I've worked there). The water started spitting out of the coffee machine. A coworker walked by and said something droll like - 'Doesn't seem to be working right, Karen'. I said 'Sh*t!' and popped in the filter basket. Oops. Right after that, I spilled some coffee on the counter. Can't win for losing. Day 809 - Thursday already! 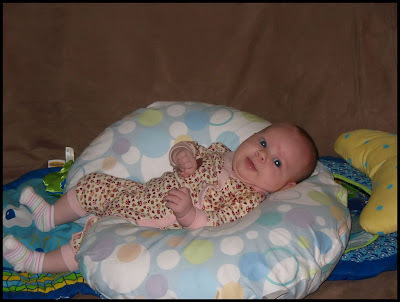 Look how much Savannah has grown in comparison to that 'Boppy Pillow'! 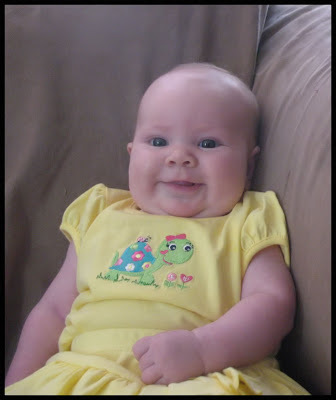 It's amazing how fast babies grow and change. And what a cute personality she has! Just too adorable, gush gush gush. I really have to say Hello and Goodbye - I'm running late for some reason this morning, maybe because I checked my email after not having checked it after work yesterday. 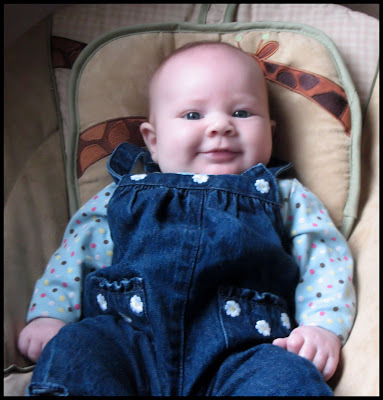 Day 808 - The Most Adorable Baby Ever! 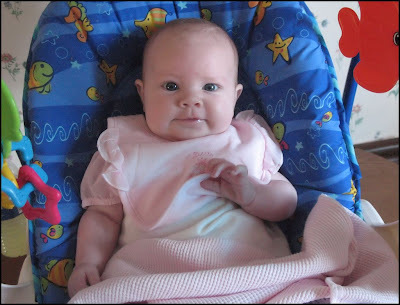 Is Savannah just the cutest baby EVER???? OMIGOSH! Look at the little Pirates of the Caribbean sneakers. True story - I was having a meeting at my desk the other day. The project manager got distracted by the pictures of Savannah wafting by on my screen saver, and apologized to me for not paying attention to ME! I didn't mind a bit, of course. It is only 5:30am, I need to leave early to pick up 'birthday goodies' to celebrate one of our team members birthdays today. I also need gas - it just figures that I need to do two errands (not counting a BLOG) before 7am! Is that a good title to make you wonder what I'm up to? The fact is - I realized the other day that I don't cry anymore... when I chop onions. I buy sweet onions now, and when I can get them, real vidalia onions. They don't make me weep, and I really don't think about it. My onion weeping has become extinct, and I won't miss it a bit. It used to be a big, teary deal to use onions, and it's all in the TYPE of onion I buy. I also don't play cassette tapes anymore. I am ready to pack them all up and give them to Goodwill unless someone can tell me how to dub them onto CDs. PLEASE HELP ME WITH THIS - Marcia - do you know how to get cassettes onto CD? Speaking of CRYING - did I already tell you this story? A girl at work started on this medication and was 'feeling funny'. TTFN and have a nice and tear-free Tuesday! Day 806 - Cinco de Mayo! Or - Sinko my Drinko! We had such nice weather yesterday, I hope it continues this week. Mid 70's and low humidty is PERFECT. I sat in the sun for FIFTEEN MINUTES yesterday and got a sunburn. Oops. 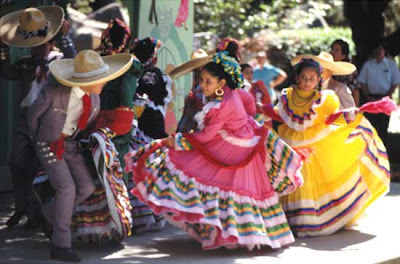 It's Cinco de Mayo, celebrating a victory of Mexican forces over the French. Americans use it as an excuse to party and drink margaritas... I think Aunt Nancy may be the family margarita expert, having been to Mexico many times - what's your favorite margarita, Nancy? Mine is Mango Margaritas with sugar around the rim rather than salt. Hope you have fun! Charlie has a beekeepers meeting tonight so I'll be swimming after work. I like Sundays, but not as much as Saturdays. I'll put up my 'church sign of the day' here - from a church 'down the road a piece'. 'Church is a gift from God. Assembly required'. Pretty smart use of words! Here's a really nice picture of a hawks nest, kindness of our friends TY and SY. I'll be leaving soon for water aerobics, then some shopping. This is also TACA craft fair weekend in downtown Nashville at Centennial park. I love to go to that craft fair, but the weather isn't cooperating to go today - it is rainy and windy. We run out of SOMETHING practically every day, which goes on the shopping list for the next adventure to the grocery store. At the moment - we need green onions, trash bags, quart bags, juice, and a bunch of other stuff. I don't see how people with a big family do it - I imagine they could easily spend $200 a week on food. Have a nice Saturday, folks! Day 803 - BEE good BEEcause it's FRIDAY! Ladies and Gentlemen, start your antihistamines! March in a circle, but leave the bees alone! Charlie's bees have arrived and are now settled in their new homes. 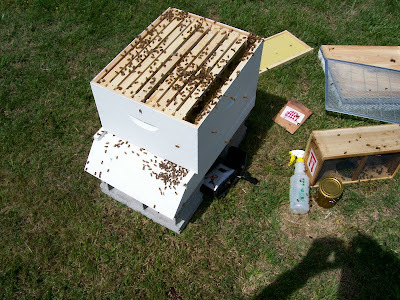 This is one of TWO hives he has now - this is the one he sent away for, assembled and painted. He won another hive at a beekeepers meeting, and that is now populated too. The brown, wooden screened box on the lower right of the photo is one of the two crates of bees that arrived at the post office yesterday, priority mail. Charlie had to go get them, then literally pour them into the hive. The spray bottle has sugar water in it. And you are asking - how many times did he get stung yesterday? The answer is twice. 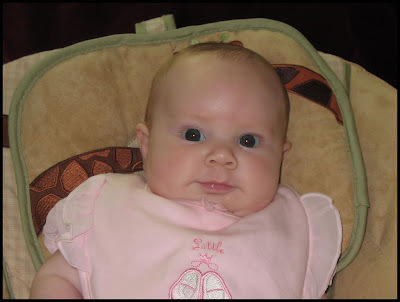 When Heather was little, she used to PLAY with bumble bees and give them names (like 'Buzzer'). She was so gentle they wouldn't sting her! She would let them crawl on her hand and she would study them. Her teacher said she would make a good biologist someday. Have a BEE-youtiful day! TTFN! Day 802 - Welcome to May! Greetings, Bloggy First of May-ers! Dance around a Maypole if you can find one. Or make a May basket, if you know what one is! Savannah is 8 weeks old today! Can't wait to go see her on Memorial Weekend. Remember to change your calendars, by the way. Sorry about having just a small picture of Savannah today, I downloaded the wrong size! Still cute!! May has lots of good stuff associated with it. Mothers Day, Memorial Day, and my mother's birthday, to mention a few! American Idol update - I can't believe that Jason is still IN it. What are people thinking? This year is the worst year yet for people with little talent making it way too far. I am still 100% on either David to win, with slight favoritism for 'young David'. He makes any song sound good. Jason C. just seems to be in some state of oblivion no matter what he sings, like he doesn't care at all. By the way - they need to have the singers sing BEFORE they are voted off, because of the 'bawl factor'. Just my opinion, and I'm sticking to it. Gotta go make my lunch - TTFN and Happy May!